Amino acids in the β subunit contribute to the action of general anaesthetics on GABAA receptors. We have now characterized the phenotypic effect of two β subunit mutations in the most abundant GABAA receptor subtype, α1β2γ2. The β2(N265M) mutation in M2 decreased the modulatory actions of propofol, etomidate and enflurane, but not of alphaxalone, while the direct actions of propofol, etomidate and alphaxalone were impaired. The β2(M286W) mutation in M3 decreased the modulatory actions of propofol, etomidate and enflurane, but not of alphaxalone, whereas the direct action of propofol and etomidate, but not of alphaxalone, was impaired. We found that the actions of general anaesthetics at α1β2(N265M)γ2 and α1β2(M286W)γ2 GABAA receptors are similar to those previously observed at α2β3(N265M)γ2 and α2β3(M286W)γ2 GABAA recpetors, respectively, with the notable exceptions that the direct action of propofol was decreased in α1β2(M286W)γ2 receptors but indistinguishable form wild type in α2β3(M286W)γ2 receptors and that the direct action of alphaxalone was decreased in α1β2(N265M)γ2 but not α2β3(N265M)γ2 receptors and indistinguishable form wild type in α1β2(M286W)γ2 receptors but increased in α2β3(M286W)γ2 receptors. Thus, selected phenotypic consequences of these two mutations are GABAA receptor subtype-specific. General anaesthetics are among the medically most widely used and important drugs. However, their mechanism of action is still poorly understood. They modulate the activity of ligand-gated ion channels (for review see [1, 2]). In particular, at surgical concentrations, most general anaesthetics potentiate GABAA receptor-mediated responses. Amino acids have been identified in the second and third transmembrane regions (TM2 and TM3) of α and β subunits which appear to be necessary for the action of general anaesthetics on the GABAA receptor. These include in TM2 an asparagine at position 265 of the β3 subunit and in TM3 a methionine at position 286 in β1 or β3 [3–6]. Most electrophysiological studies have been performed using αβ subunit combinations, whereas most GABAA receptors in the central nervous system apparently consist of α, β and γ subunits. The presence of a γ subunit may alter the effects of a mutation at these residues . Moreover, various combinations of α and β subunits might also confer distinct properties on the respective receptors. In particular, it is not known which functional consequences a mutation in the TM2 or TM3 region of the β subunit would have on the by far most abundant GABAA receptor subtype in the CNS, α1β2γ2, which represents ca. 50% of all GABAA receptors . The α1β2γ2 GABAA receptor is an interesting candidate for mediating anaesthetic responses in vivo. We therefore investigated the pharmacological properties of recombinant α1β2γ2 receptors carrying the β2(N265M) and β2(M286W) mutations to assess their suitability as potential knock-in point mutations in mice. To determine the relevance of the amino acids N265 and M286 in the GABAA receptor β2 subunit for the action of general anaesthetics on the α1β2γ2 GABAA receptor, we introduced the point mutations β2(N265M) and β2(M286W) by site directed mutagenesis. Wild-type and mutant β2 subunits were coexpressed with α1 and γ2 subunits in HEK 293 cells. The GABA EC50 value for the α1β2γ2 receptor was 5.9 ± 0.5 μM (n = 8), in line with previously published reports (4.5–20 μM) [9–12] (Fig. 1). The presence of the γ2 subunit in the receptor complex was confirmed by the observation that 1 μM diazepam potentiate the current evoked by 32 μM GABA by 277 ± 48.2 % (not shown). The GABA dose-response curve for the α1β2(N265M)γ2 receptor was shifted to the right with an EC50 of 20 ± 2.2 μM (n = 8) which was significantly higher than the EC50 of the α1β2γ2 receptor (5.9 ± 0.5 μM (n = 8); p < 0.05) (Fig. 1). In contrast, the GABA dose-response curve for the α1β2(M286W)γ2 receptor was shifted to the left with an EC50 of 1.9 ± 0.15 μM (n = 8) significantly smaller compared to wild type (p < 0.05) (Fig. 1). The Hill coeffient was not significantly altered by the two mutations (α1β2γ2: Hill = 1.4 ± 0.15; α1β2(N265M)γ2: Hill = 1.4 ± 0.2; α1β2(M286W)γ2: Hill = 1.5 ± 0.2). The Imax values for all receptor combinations were not significantly different (α1β2γ2: Imax = 1269 ± 524 pA; α1β2(N265M)γ2: Imax = 1944 ± 562 pA (p > 0.05); α1β2(M286W)γ2: Imax = 1947 ± 646 pA (p > 0.05)). Thus, whereas the N265M mutation decreased the sensitivity to GABA, the M286W mutation led to an increase in the sensitivity to GABA. GABA dose-response curves for wild-type and point-mutated α1β2γ2 GABAA receptors transiently expressed in HEK 293 cells. The data points and error bars represent the means and standard errors for the different GABA concentrations (n = 8). To test the modulatory activity of anaesthetics, GABA concentrations corresponding to the EC15 were used (α1β2γ2: 3 μM; α1β2(N265M)γ2: 8 μM; α1β2(M286W)γ2: 1 μM). Propofol is a widely used intravenous general anaesthetic agent. In HEK 293 cells expressing the α1β2γ2 receptor, 10 μM propofol potentiated the GABA-induced chloride current by 100.7 ± 17% (n = 16). In cells expressing the α1β2(N265M)γ2 receptor, this potentiation amounted to 43.5 ± 10.1% (n = 10) and thus was significantly smaller (p < 0.05). Similarly, in cells expressing α1β2(M286W)γ2 receptor the potentiation was 48.4 ± 13.2% (n = 16), and thus also significantly smaller than in wild type (p < 0.05). Thus, the β2(N265M) mutation and the β2(M286W) mutation significantly reduced the potentiation of GABA-induced chloride currents by propofol (Fig. 2). Modulatory action of intravenous general anesthetic at α1β2γ2 GABAA receptors. (a) Single traces of the effects of the intravenous anaesthetics propofol (Prop), etomidate (Etom) and alphaxalone (Alphax) on GABA-evoked chloride currents. (b) The potentiation of the GABA-evoked chloride currents is expressed relative to the control currents at the given GABA concentration (means ± standard error, n = 10–17; *p < 0.05; Student's t-test). Etomidate is also a clinically used intravenous anaesthetic. In cells expressing α1β2γ2 receptors, 10 μM etomidate potentiated the GABA-induced chloride current by 372 ± 103.4% (n = 10). The potentiation at the α1β2(N265M)γ2 receptor was significantly smaller (83.7 ± 23.5%; n = 13; p < 0.05), as was the potentiation at the α1β2(M286W)γ2 receptor (87.4 ± 34.1%; n = 11; p < 0.05). Thus, both the β2(N265M) mutation and the β2(M286W) mutation significantly reduce the potentiation of GABA-induced chloride currents by etomidate (Fig. 2). 5 μM of the neuroactive steroid anaesthetic alphaxalone potentiated the GABA-induced current in cells expressing the α1β2γ2 receptor by 327 ± 59.4% (n = 17), in cells expression the α1β2(N265M)γ2 receptor 346.5 ± 97.4% (n = 11) and in cells expressing the α1β2(M286W)γ2 receptor by 201.6 ± 45.6% (n = 14). The values obtained for the mutant receptors were not significantly different from wild type. Thus, both mutations have no effect on the potentiation of GABA-induced chloride currents by alpaxalone (Fig. 2). Enflurane is a clinically used volatile general anaesthetic. 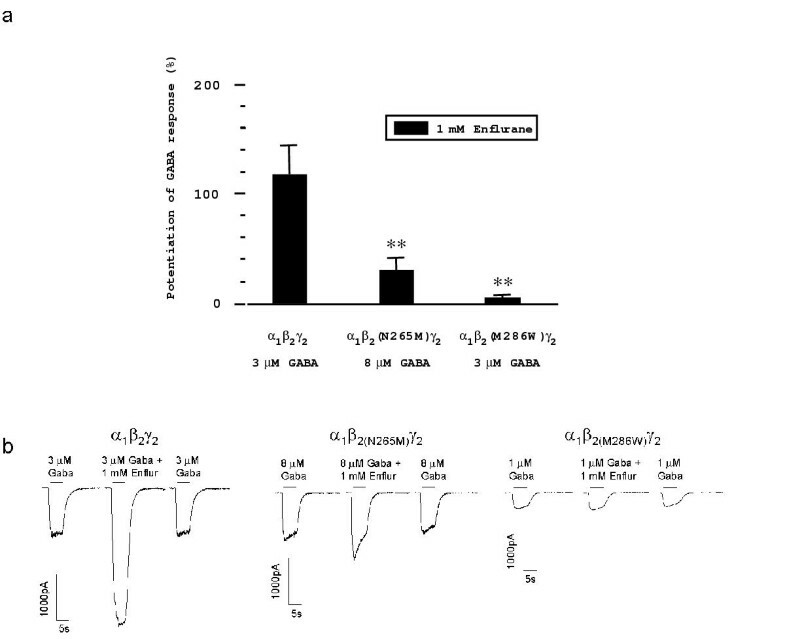 1 mM enflurane potentiated GABA-induced currents by 119.4 ± 23% (n = 8) in cells expressing the α1β2γ2 receptor, 31.7 ± 10% (n = 13) in cells expressing the α1β2(N265M)γ2 receptor and 4.8 ± 2.1% (n = 11) in cells expressing the α1β2(M286W)γ2 receptor (Fig. 3). The values for both mutant receptors are significantly different from wild type (p < 0.01). Thus, both mutations significantly reduce the potentiation of GABA-induced chloride currents by enflurane. 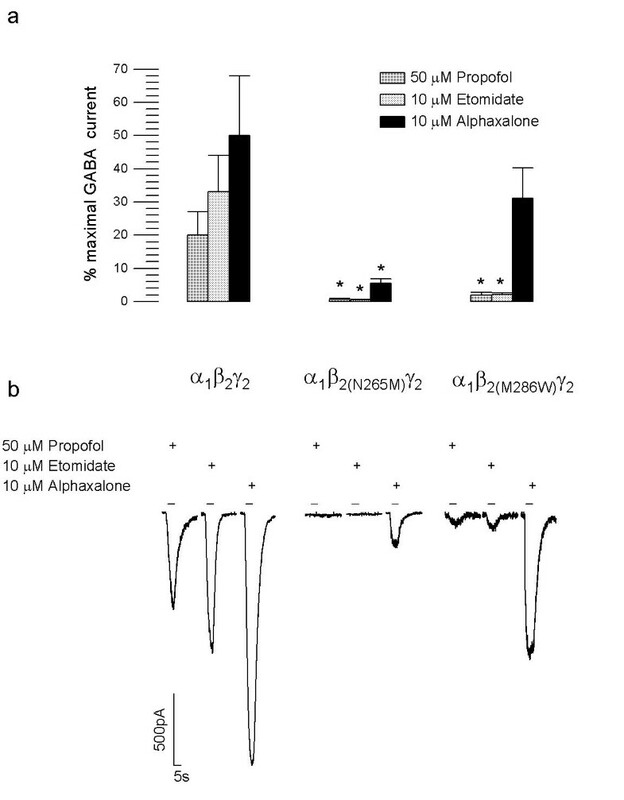 Modulatory action of the volatile general anaesthetic enflurane at α1β2γ2 GABAA receptors. (a) Histogram of the modulation of GABA-induced chloride currents by enflurane (means ± standard error, n = 8–13; **p < 0.01; Student's t-test). (b) Single traces showing the effects of the volatile anaesthetic enflurane (enflur) on GABA-evoked chloride currents. 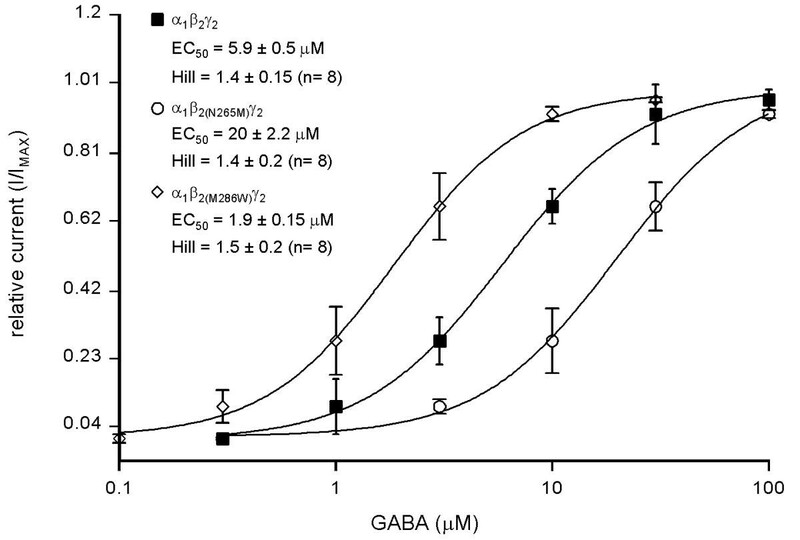 At concentrations usually higher than those required for potentiation of GABA-induced chloride currents, propofol, etomidate and alphaxalone display a direct agonistic action on GABAA receptors. The direct actions of these compounds were compared to the maximal GABA current at the respective receptor, which was determined separately. 50 μM propofol induced a chloride current amounting to 20 ± 7 % (n = 12) of the maximal GABA-induced current, which was determined separately, in cells expressing the α1β2γ2 receptor (Fig. 4). In contrast, in cells expressing the α1β2(N265M)γ2 or α1β2(M286W)γ2 receptors, 50 μM propofol induced chloride currents amounting to 0.7% ± 0.3% (n = 17) and 2.0 ± 0.8% (n = 10), respectively, of the maximal GABA-induced current, thus being significantly smaller (p < 0.05) compared to wild type (Fig. 4). Thus, both mutations almost abolish the direct action of propofol on the α1β2γ2 receptor. Direct activation of α1β2γ2 GABAA receptors by intravenous general anesthetics. (a) Bar histogram of the direct activation of GABAA receptor-mediated chloride currents by propofol, etomidate and alphaxalone. Data points represent means ± standard error, n = 9–19; *p < 0.05; Student's t-test). (b) Selected traces showing representative whole-cell chloride currents activated by propofol, etomidate and alphaxalone. 10 μM Etomidate induced a chloride current amounting to 33 ± 11% (n = 13) of the maximal GABA-induced current in cells expressing the α1β2γ2 receptor (Fig. 4). In cells expressing α1β2(N265M)γ2 or α1β2(M286W)γ2 receptors, this direct effect was significantly reduced to 0.4 ± 0.2% (n = 19; p < 0.05) and 2.1 ± 0.5% (n = 10); p < 0.05), respectively (Fig. 4). Thus, the two point mutations abolish the direct action of etomidate on the α1β2γ2 receptor. 10 μM Alphaxalone induced a chloride current amounting to 49.8% ± 18% (n = 12) of the maximal GABA-induced chloride current in cells expressing the α1β2γ2 receptor (Fig. 4). Whereas the alphaxalone-induced current is significantly reduced in cells expressing the α1β2(N265M)γ2 receptor (5.6 ± 1.2%; n = 19, p < 0.05), it was non-significantly decreased in cells expressing the α1β2(M286W)γ2 receptor (31.1 ± 9.1%; n = 9) (Fig. 4). Thus, while the β2(N265M) mutation significantly reduces the extent of direct activation by alphaxalone, the β2(M286W) mutation had no effect. In the present study we assessed the phenotypic consequences of two point mutations in the second (TM2) and third (TM3) transmembrane domains of the GABAA receptor β2 subunit, β2(N265M) and β2(M286W), respectively, with respect to GABA sensitivity and the action of general anaesthetic agents on the most abundant GABAA receptor subtype in the central nervous system, α1β2γ2. This is particularly important for potential future analysis of these mutations in knock-in point-mutated mice. At amino acid position 265 of the β2 subunit, an asparagine has been replaced by a methionine, which is the corresponding residue in the etomidate-insensitive Drosophila rdl receptor. The β3(N265M) mutation indeed largely abolished the direct and modulatory actions of etomidate and propofol on α6β3γ2 receptors [3, 13]. 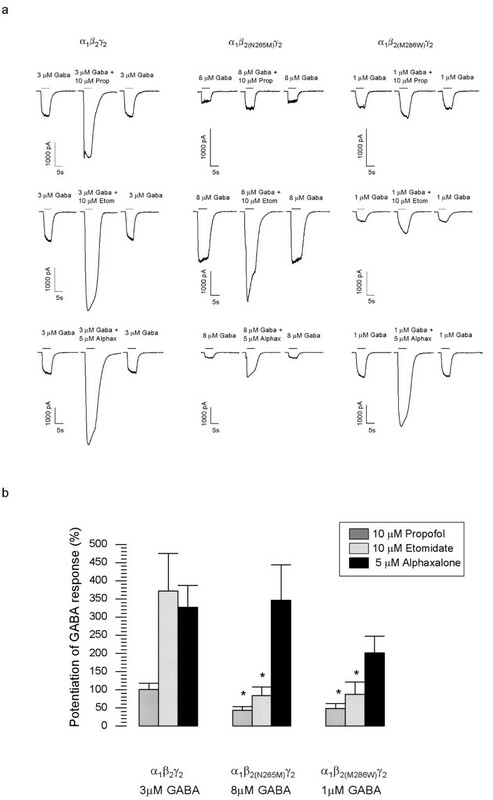 In α2β1(S265I) receptors, the potentiation of the GABA current by enflurane was inhibited by less than 50%, however, the potentiation by isoflurane was completely abolished, while the potentiating action of propofol, etomidate, methohexital and alphaxalone was not changed [4, 6]. In the same study, the direct action of propofol and etomidate, but not methohexital was shown to be impaired by this mutation . Recently, we showed that the β3(N265M) mutation, when studied in the α2β3(N265M)γ2 receptor, almost abolished the modulatory actions of propofol and etomidate, but not alphaxalone, and reduced the modulatory action of enflurane by ca. 80% . Likewise, the direct actions of propofol and etomidate, but not alphaxalone were almost abolished . In the present study, we find that the β2(N265M) mutation decreases the sensitivity of the α1β2γ2 receptor for GABA, with an increase of the EC50 value from 5.9 ± 0.5 μM to 20 ± 2.2 μM. Harrison and colleagues  also reported a shift of the GABA dose-response curve to the right by this mutation. We show that this mutation significantly reduces the modulatory action of propofol, etomidate and enflurane, but not alphaxalone, similar to what we previously reported for the α2β3γ2 receptor . Nishikawa et al. recently observed that the modulatory action of the volatile anesthetics isoflurane, sevoflurane and desflurane at α1β2(N265M)γ2 receptors is also reduced. In α1β2(N265M)γ2 receptors, the direct action of etomidate and propofol was completely abolished, which is in line with the results obtained on the α2β3(N265M)γ2 receptor, while the direct action of alphaxalone was significantly reduced, in contrast to our results obtained on the α2β3(N265M)γ2 receptor . Thus, with the notable exception of the direct action of alphaxalone, similar results were obtained concerning the effect on the N265M mutation in the β2 and β3 subunits. At amino acid position 286 of the β2 subunit, a methionine was replaced by a tryptophane. Tryptophan is the homologous residue in the GABAA receptor ρ1 subunit, which is insensitive for general anaesthetics, e.g., enflurane . When the β1(M286W) mutation was studied in α1β1 receptors, the modulatory action of enflurane was abolished . When this mutation was introduced into α2β1 receptors, the modulatory action of isoflurane and propofol were abolished and the modulatory action of methohexital reduced, but the modulatory actions of etomidate and alphaxalone were unaffected by the mutation . In contrast, the direct action of etomidate was decreased, but the direct action of propofol and methohexital were not changed . The same group also found that the GABA sensitivity was unchanged compared to wild type in the α2β1(M286W) receptor as well as in the α1β2(M286W)γ2 receptor [6, 16]. In the present study, however, we find that the EC50 of the α1β2(M286W)γ2 receptor is reduced approximately three-fold. Our findings are in line with our observation that the corresponding β3(M286W) mutation also leads to a similar reduction of the EC50 in α2β3(M286W)γ2 receptors. The source of the discrepancies between the results reported by the two groups are not clear. For etomidate, Harrison and colleagues reported no significant change of the modulatory action on α2β1(M286W) receptors compared to wild type , but a significant reduction of the modulatory action on the α1β2(M286W)γ2 receptor compared to wild type (from 237 ± 45% (n = 6) in wild type to 162 ± 11% (n = 5)) . With the same concentration of etomidate (10 μM), we observed a decrease of the modulatory action from 372 ± 103.4% (n = 10) in wild type to 87.4 ± 34.1% (n = 11; p < 0.05). In our study, the β2(M286W) mutation had no significant effect on the modulatory action of alphaxalone. This is in line with the observation that the modulatory effect of alphaxalone is indistinguishable from wild type in α2β1(M286W) and α1β2(M286W)γ2 receptors [6, 16] as well as α2β3(M286W)γ2 receptors . Our finding that the enflurane action is almost completely abolished in the α1β2(M286W)γ2 receptor also corresponds with our previous findings on the α2β3(M286W)γ2 receptor . Whereas the direct action of propofol on the α2β1(M286W) receptor has been reported to be indistinguishable from wild type, the direct action of etomidate was reported to be significantly reduced in the α2β1(M286W) receptor . In our study, however, using the same concentration of propofol (50 μM), we found a significant decrease of the direct activation of the α1β2(M286W)γ2 receptor compared to wild type. The direct action of etomidate was also significantly reduced. A reduction of the direct action of propofol on the α1β2(M286W)γ2 receptor was also reported by . In contrast, we previously reported that the direct action of propofol is indistinguishable from wild type in the α2β3(M286W)γ2 receptor . These results are consistent with the notion that the M286W mutation has different phenotypic consequences in GABAA receptors with different αβγ subunit combinations. A further subtype-specific difference in the direct action of anaesthetics was observed for the neuroactive steroid alphaxalone. Whereas the direct effect of alphaxalone on the α2β3(M286W)γ2 receptor was significantly higher compared to wild type, the direct effect of alphaxalone was indistinguishable from wild type in the α1β2(M286W)γ2 receptor. In conclusion, this study demonstrates the consequences of the β2(N265M) and β2(M286W) mutations on anaesthetic actions on the most abundant GABAA receptor subtype in the central nervous system, α1β2γ2, indicating that these mutations are suitable to study the relevance of this GABAA receptor for general anaesthesia in mice. At the same time, they demonstrate that the phenotypic consequences of mutations at homologous positions of β subunits can vary between receptor subtypes and that extrapolations should only been done with caution. Experimental procedures were similar to those described previously . Rat α1, β2, and γ2short subunit cDNAs in the expression vector pBC12/CMV  were used in this study. In the β2 subunit, the asparagine residue at position 265 was changed to a methionine residue [β2(N265M)] and, independently, the methionine residue at position 286 was changed to a tryptophane residue [β2(M286W)] using the QuikChange® site-directed mutagenesis kit (Stratagene, La Jolla, California, USA) with complementary oligonucleotides spanning the mutations. For the [β2(N265M)] mutation, oligonucleotides SL-3: 5'-GACGATGACCACAATCATG ACCCATCTCCGGGAGACTC-3' and SL-4: 5'-GAGTCTCCCGGAGATGGGTCAT GATTGTGGTCATCGTC-3' were used (mutated codon underlined). For the [β2(M286W)] mutation, oligos SL-5: 5'-GCCATTGACATGTACCTA TGG GGGTGCTTTGTCTTTGTC-3' and SL-6: 5'-ACAAAGACAAAGCACCCCCA TAGGTACATGTCAATGGC-3' were used (mutated codon underlined). The numbering of amino acids is based on the mature protein after cleavage of the signal peptide. Human embryonic kidney cells 293 (HEK 293) were grown in Dulbecco's modified Eagle medium (DMEM, Gibco, Invitrogen, Basel, Switzerland) supplemented with 5% heat inactivated fetal calf serum (FCS, Gibco, Invitrogen, Basel, Switzerland), 100 U/ml penicillin and 100 mg/ml streptomycin (both from Gibco, Invitrogen, Basel, Switzerland). Cells were transiently transfected using the calcium phosphate precipitation technique. The patch-clamp technique in the whole-cell configuration was used to record GABA-induced Cl- currents. The membrane potential was held at -60 mV. The current signals were amplified with an Axopatch-1D amplifier (Axon Instruments, Inc., Foster City, CA, USA), filtered by a 1 KHz four-pole Bessel low-pass filter. The analysis of data was performed using the pClamp data acquisition program set (pClamp 8.0, Axon Instruments) and FigP (Biosoft, Cambridge, UK). The GABA dose-response curves were obtained by applying 5-sec pulses of GABA every 1.5 min to the patch-clamped HEK 293 cells. The maximum current amplitudes from individual cells were first fitted separately using the equation I/Imax = 1/ (1+ (EC50/ [GABA])Hill), where I is GABA-evoked current, Imax is the maximum of the fit, EC50 is the GABA concentration evoking the half-maximal response, and Hill is the Hill coefficient. The individual dose-response curves were then normalized to Imax, and the data replotted using the mean values for each concentration. GABA was applied in the presence or absence of drugs to the patch-clamped cell for 5 sec every 1.5 min using a multibarrelled microapplicator pipette constructed from seven concentrically arranged glass tubes ending in a common tip. Air-tight syringes, containing the solutions, were connected to the microapplicator via Teflon tubes, in order to avoid loss of the anaesthetics due to evaporation or sticking to the tubes. Six of the tubes were used for drug delivery, and the seventh tube at the center provided slow aspiration to prevent accumulation of drugs in the common tip and leakage from the inactive barrels. To allow a rapid shut-off of the drug application, a sucking pipette was placed in front of the tip of the drug-applicator, in order that the tested cell was positioned between the applicator and the suction. In this way, the solution coming from the application bathed the cell and was directly and rapidly sucked out by the suction. The recording pipettes were filled with an intracellular saline solution containing 120 mM CsCl, 20 mM TEACl, 1 mM CaCl2, 2 mM MgCl2, 11 mM EGTA, 10 mM HEPES, adjusted to pH 7.2 with CsOH. The cells, placed in a petri-dish fitting into the recording chamber, were continuously superfused with a bath solution using a second applicator. The bath solution contained 157 mM NaCl, 5.4 mM KCl, 1.8 mM CaCl2, 1 mM MgCl2 and 5 mM HEPES, adjusted to pH 7.4 with NaOH. The experiments were performed at room temperature. GABA was from Sigma (St. Louis, Mo, USA), etomidate from Janssen Pharmaceutica (Beerse, Belgium). Propofol from Aldrich (Buchs, Switzerland), alphaxalone from Sigma (Buchs, Switzerland) and enflurane from Abbott Laboratories (Cham/ Zug, Switzerland). GABA was dissolved in water and used at concentrations of 3 μM for α1β2γ2 receptors, 8 μM α1β2(N265M)γ2 receptors and of 1 μM for α1β2(M286W)γ2 receptors, which correspond to EC15 for all receptors. Stock solutions of the test compounds were prepared in 100 % DMSO and diluted 1000-fold before use. During the experiments, the final concentrations of DMSO in the bath solutions were not higher than 0.1 %, which had no effect on GABA responses. The volatile enflurane was dissolved in the external solution. Fresh solutions were prepared every hour. We expect only a small loss of enflurane of ca. 10% to 15%, which would affect recordings from wild type and mutant receptors in the same way. Roberta Siegwart, Karin Krähenbühl contributed equally to this work. This work was supported by the Swiss National Science Foundation. R.S. and K.K. performed and analyzed the electrophysiological experiments and drafted the manuscript, S.L. performed the molecular biology work, and U.R. directed the study and drafted and finalized the manuscript. All authors read and approved the final manuscript.